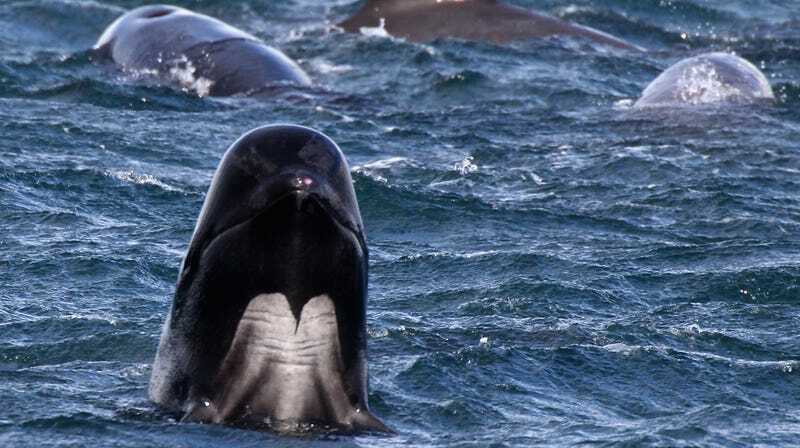 A pod of pilot whales struggling not to beach themselves off the waters of Scotland, 2011. A male pilot whale struggled for five days to stay alive in Thailand near the Malaysian border after rescuers found it with 17 pounds of plastic bags in its stomach, the Washington Post reported on Sunday, but it ultimately succumbed to its illnesses. The whale died on Friday, the Post wrote, and an autopsy discovered what Thailand’s Department of Marine and Coastal Resources said were 80 plastic bags lodged in its stomach. According to the Post, it is not clear whether the whale was a short-finned or long-finned pilot whale, but the short-finned whale is native to the region. Neither species is listed as threatened or endangered by the IUCN Red List, though the listing for the short-finned species mentions that a 30 percent decline in population sizes over 71 years “cannot be ruled out.” Threats to the whales include hunting operations of varying legality, fishery nets, and future impacts of climate change that remain “unclear,” the Red List added. Thon told AFP that at least 300 marine animals perish in Thai waters annually after ingesting plastic, which humans dump in huge quantities into oceans worldwide and can take hundreds of years to disappear completely. Much of the garbage is swept around for lengthy amounts of time, putting marine life that may swallow or get entangled in it at risk, and when it breaks down into smaller pieces it can pollute the ocean with both massive clouds of tiny “microplastic” and harmful chemicals. It is believed that a significant amount of the garbage ends up at the bottom of the ocean, with incompletely understood effects on the marine ecosystem (that are probably not good). Per the Post, a 2014 study concluded at least five trillion pieces of trash were in the world’s oceans, with 270,000 tons of large and small plastic debris near the surface. More recent estimates look even less flattering for human stewardship of the environment, with a 2018 study concluding the Great Pacific Garbage patch alone is believed to contain up to 87,000 tons of plastic. The Gulf of Thailand is one of the many waters around the world with a particular abundance of plastic pollution. The Bangkok Post reported last year that snorkellers had found a 1-kilometer clump of floating trash off in Prachuap Khiri Khan province just months after another was found in the region February. According to another report by the Nation, a 2015 study by the Ocean Conservancy and the McKinsey Centre for Business and Environment found that Thailand was the world’s “sixth worst offender for dumping plastics into the sea.” Thailand’s Pollution Control Department says plastic waste is increasing by roughly 12 percent annually, with only 25 percent being reused (the vast majority of it plastic bags). The Bangkok Post writes that the 23 coastal provinces in Thailand generate around 11 million tons of garbage daily, of which approximately 1.1 million tons ends up being dumped directly into the sea. Plastic pollution throughout the region is expected to remain a significant issue, as many Asian countries are experiencing economic growth that is outpacing waste management infrastructure.